Siena is a 667-acre age-qualified community located within the master-planned community of Summerlin in Las Vegas, Nevada. Secluded behind a six-foot high masonry perimeter wall and manned gate-guarded entries will be approximately 2,001 homes surrounding a Schmidt-Curley designed 18-hole championship golf course. In addition to the golf course, residents will enjoy a wide array of amenities in the Village Center overlooking Lake Siena, elegant gardens, cascading waterfalls and several dramatic holes of golf. The Golf Clubhouse will be the first Village building to come into view; next, the Community Center, then the Health & Fitness Center. The newly-opened 15,000-square-foot Golf Clubhouse, contains a spacious full-service golf shop, casual Grille Room and an exterior dining patio overlooking Lake Siena, the driving range and 18th green of the golf course. The 38,000-square-foot Village Community Center is the hub for social and club activities. At its center, is a 7,200-square-foot Grand Ballroom and stage facility and nearly 9,000 square-feet of arts and crafts space, meeting rooms, library, business center, computer lab, and billiard and card rooms. The 15,900-square-foot Health & Fitness Center contains a Wellness Center, staffed by Summerlin Hospital, that provides diagnostic services, plus state-of-the-art cardiovascular and weight equipment, gentlemen’s and ladies’ locker rooms, each with its own sauna, steam and massage rooms, and a four lane, 25 meter indoor lap swimming pool. In total, the Village Center contains over 71,000 square feet of interior space, all of which is connected by a meandering pedestrian walk adjacent to the lake, streams and waterfalls that border the first golf hole. In addition to the extensive array of indoor recreational amenities, and adjoining the Health & Fitness Center, is an exciting offering of outdoor amenities including a resort-style swimming pool, a tennis club with four lighted courts, horseshoe pits, bocce ball courts, and an extensive trail system which will accommodate a leisurely walk or a vigorous jog. Homes at Siena range from 1,040 to nearly 3,200 square feet and are priced from the $400,000s to over $1,000,000 for premium golf course home sites. Not less than 80 percent of the homes will be sold to households where at least one person is 55 years of age or older, while the remaining homes could be sold to households where at least one person is between 50 and 55 years of age. One-third of the homes at Siena will front on the golf course, while the remaining homes will open onto spacious yards. To date, over 1970 homes have been sold. Initial land development at Siena began in February 1999. Construction of the model homes began in July 1999 and residential housing in August 1999. 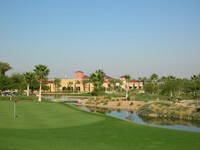 The first nine holes of the golf course opened in January 2000. The remaining nine holes opened in June 2000. Construction began on the Health and Fitness Center in February 2000 and was completed in December 2000. Construction on the Golf Clubhouse began in September 2001 and was completed in May 2002. The first residents began moving in during November 1999. Siena is located in the Southwest portion of the 22,500-acre master-planned community of Summerlin, developed by the Howard Hughes Corporation in western Las Vegas. 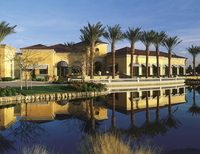 Summerlin has been one of the best selling master-planned communities in the United States. The reasons for this success are apparent. Well planned and well executed, every aspect of Summerlin displays quality and attention to detail. From the impressive entries to the sweeping boulevards manicured to perfection, Summerlin stands out as the premier master-planned community in Las Vegas and one of America’s premier master-planned communities. Siena has the perfect location in West Las Vegas – quiet and secluded, yet conveniently close to the dazzling array of amenities Las Vegas has to offer. With Town Center Drive as its main entrance, Flamingo Road on the north and Tropicana Avenue in its center, Siena enjoys quick, easy access to shopping, dining and entertainment throughout Summerlin and the famous Las Vegas Strip. McCarran International Airport, located eight miles East of the property on Tropicana Avenue, and currently just 15 minutes away, provides direct domestic and international flights to many major cities. The new Las Vegas Beltway, located one-quarter mile North of Siena, provides exceptionally convenient access to and from these highly desirable points in Las Vegas. The Beltway construction was funded by secure local sources, including a dedicated sales tax allocation and vehicle registration fees.